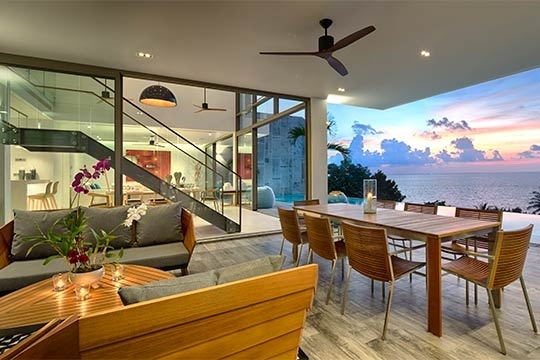 With flawless modern design and a majestic setting overlooking Nai Thon Beach, the 4-bedroom Malaiwana Duplex is an enticing escape for families or groups. 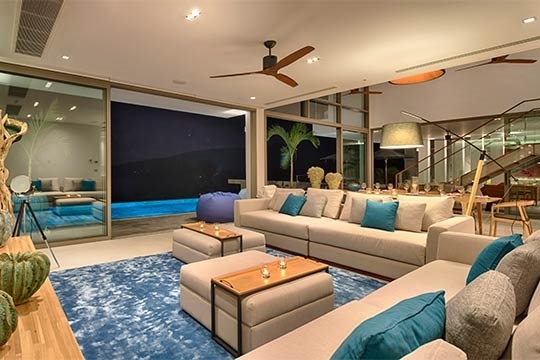 Found in a prestigious hillside estate with panoramic sea and sunset views, this fully-staffed retreat has a 15m private pool, personal chef and lavish bedroom suites. 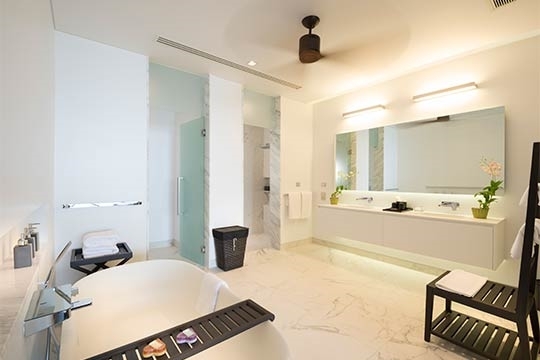 Imagine this: within 30 minutes of arrival at Phuket airport, you’re settling into your luxurious private pool retreat, taking in some awe-inspiring sea views while being served a refreshing drink by a dedicated team of staff. 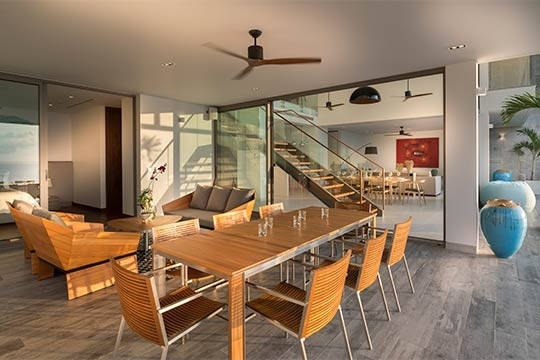 Welcome to Malaiwana Duplex, a modern four-bedroom, two-storey holiday home found in a luxury residence within Malaiwana estate. 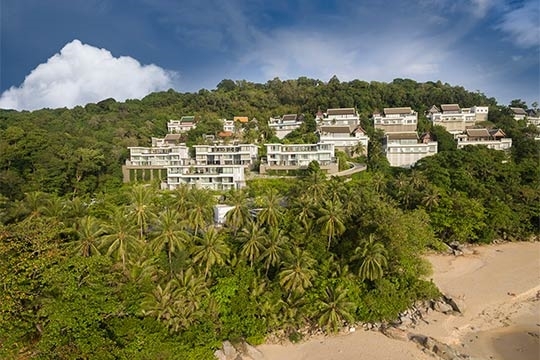 Its exclusive location on the hillside overlooks Nai Thon Beach, an idyllic one-kilometre stretch of sand on the Thai island’s peaceful northwest coast. Families and groups will find ample comforts here, with a sparkling 15-metre pool on the terrace, stylish outdoor and indoor living areas and a Western kitchen. 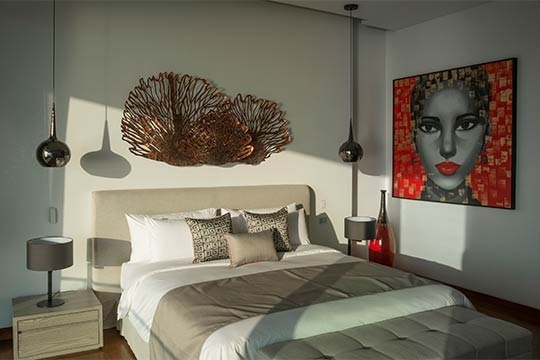 On the top floor, two king-bedded master bedroom suites offer panoramic sea views and plush ensuite bathrooms while a third bedroom is fitted with ensuite bathrooms and beds that can be set up as king-sized or twin beds. Similar features are found in the fourth bedroom on the lower level, plus it has superb sea views and opens to the pool terrace. Ease of access is another feature here, with estate shuttle buggies to help transport guests up and down the hill, and a private lift to connect the two floors. Though a handful of excellent restaurants are found nearby, dining in is a delight at the Duplex, not only because of its sea-view indoor and outdoor dining areas but with a skilled chef available to prepare every meal from a suggestion menu (provisions charged at cost plus a small surcharge). 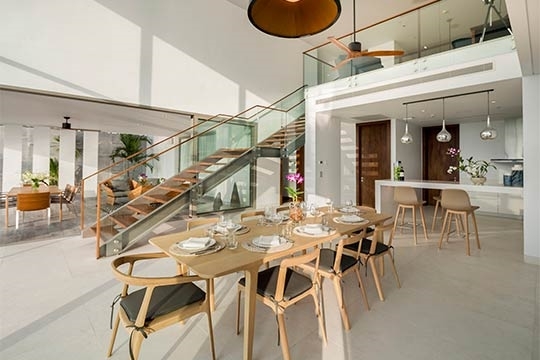 The indoor dining area is connected to the living area in an open-plan room designed in crisp, modern white and grey tones that opens completely to the pool terrace. 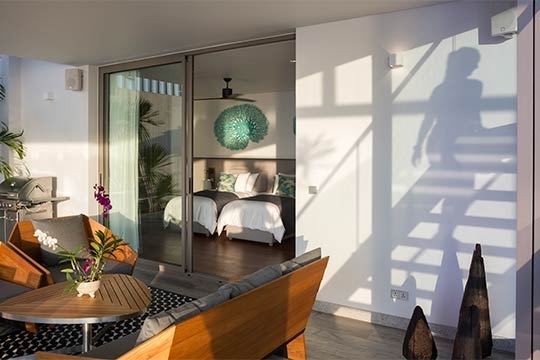 For holiday delights beyond simply relaxing in the Duplex, the beach with its soft sands, umbrella rentals, casual sea-view bars and surf/standup paddling is just a short walk away. Or ask your villa manager for help in arranging in-house spa treatments, yacht charters, scuba diving daytrips, golf bookings, shopping excursions, tours and more. 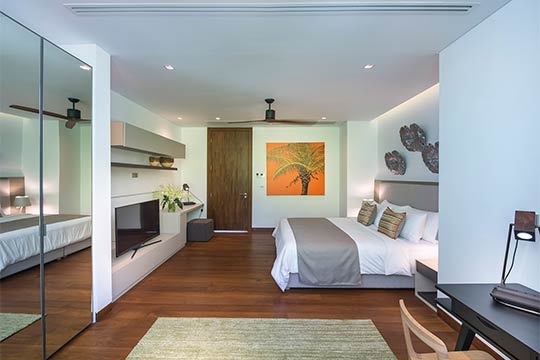 A modern luxury escape within metres of tranquil Nai Thon Beach. Vivid tropical skies, fiery sunsets and crystal-blue seas … Nai Thon Beach is a truly idyllic place, and viewed from our private poolside within Malaiwana Duplex it looks even more spectacular. 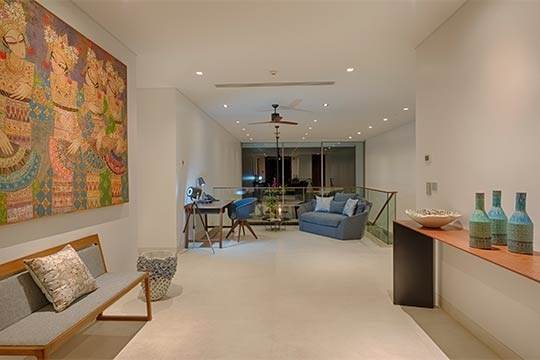 We quickly relaxed and eased into the cool, subtle interior of the Duplex, which forms a calming contrast to the colourful tropical surrounds. Though the Duplex is found within a three-unit, three-storey residence we enjoyed complete peace and privacy here and neither heard nor saw any of our neighbours. The 15-metre pool is gorgeous. 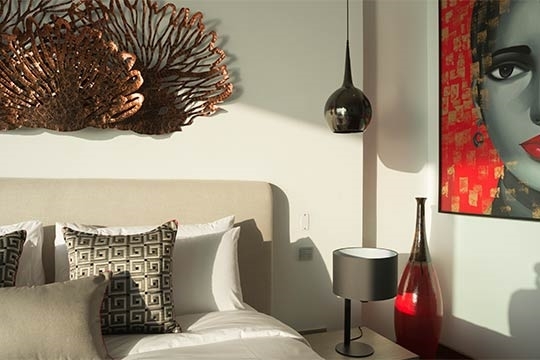 The Duplex is the perfect place for what we call a full-spectrum holiday: enjoying five-star comfort and service while having the simple, natural pleasures of a tropical island at our doorstep. Having an early-morning swim in the pool, then a decadent breakfast served in style and total privacy on the terrace. Later on, a stroll along the sand and a snack of grilled chicken on a skewer from a beachside food vendor. Then back up to the Duplex in time for sunset cocktails and an elaborate dinner of rich Thai curries, spicy whole fish and stir-fried veggies, all planned the day before with our chef. Finally to bed, where the master suite offers a soft, sumptuous embrace and the promise of more fabulous sea views, just a curtain-peek away upon waking up tomorrow. We nearly wept on leaving this fabulous haven and its awe-inspiring views to return to the real world. 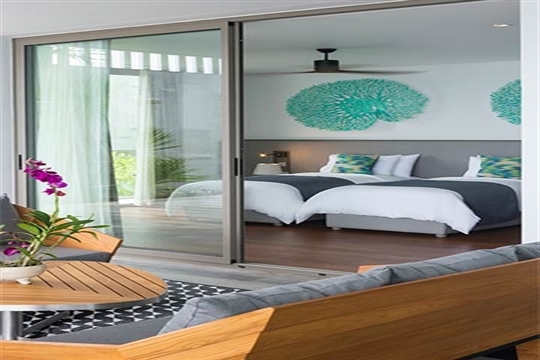 Nai Thon is one of our favourite Phuket beaches and this, combined with the delicious meals prepared by the chef and the caring service from the staff, left us feeling like well-pampered celebrities throughout our stay. Though the Duplex is enticingly close to Nai Thon Beach, the route is steep, so if walking is a challenge an estate buggy can be summoned. With no safety fence around the pool, families with toddlers will need to be vigilant. I am having fun here. 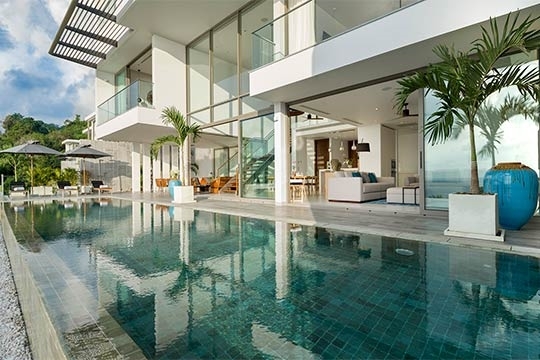 The house is very big and great views. Thank you very much. We had a really great experience during these days. Great sea view, comfortable room and wonderful service. Thank you kitty and her team. Beautiful place and treasured trip. We are very satisfied with the environment and your service. We like Kathy and all staff and we will come again. What an amazing 4 days. A beautiful villa with a view to kill for A dream vacation stay and a superb crew (Wawa and partners) made this a memorable family holiday for all of us. An absolutely amazing stay. We hope to be back again. We have had the most amazing 10 days in 2 wonderful villas. The villas are exceptional beautiful and surroundings with amazing views. The pool has provided so much fun for the kids. The wonderful girl who has have looked after us has been incredible. Beautiful people with such wonderful smiles, they have looked after us so well. The cooking has been out of this world. Everything so beautiful presented and just so so tasty. We feel very privileged and lucky to have had some time here. Thank you for your good care and kindness. We had a wonderful time in the villa. Chef Gear and Joy made sure that kids had food ready for them after their swim or a tiring day outside. Our villa manger, Kaew was very helpful with our day to day activities and was available anytime of the day. We would love to come again. Thank you so much for making this trip so memorable. Thank you for pick up us from airport on time. The villa very impressive and the service crew are always helpful and friendly. Enjoy a very good vacation. We will come back next year. Thank you katy and crew. The week at Malaiwana was relaxing and memorable. Wonderful meals, fabulous views and warm smiles. We hope to come again soon. It was really a great awesome experience staying at Malaiwana for our group. Villa Manager Khun Noy is especially helpful, attentive and detailed in making arrangements to take care of our group at one villa. I will strongly recommend to my friends network Malaiwana and also the service of Elite Havens. Thank you for the kind hospitality. We appreciate everything you did for us. Service was top hotel and the food perfect by the chef and was so delicious! The first porridge is a must try. The view and villa is so beautiful. We will definitely come back. Nice view and nice service. Thank you for Khun, Sunny, Khun and Gibzy for beyond awesome hospitality. Truly the land of smiles. I enjoyed myself very much. Sunny was great help to me after finding out I got stung by a sea urchin. She went out of her way to help buy items that removed that urchin spines. Thank you so much. Happy New Year! Very good service. Thank you very much. Great views, great staff, this is an amazing place. The in-villa dinner was excellent - try the yellow curry with beef. Also, the tod mun pla (fish cake) were great, in fact, everything was great. Enjoy! This is the most amazing place that we have been. The people here are friendly, helpful and nice. We would definitely come back again. The chef is the best cook! 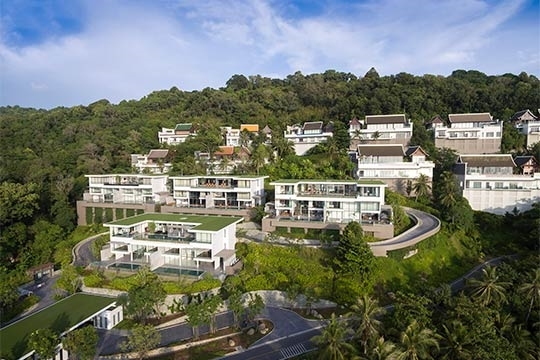 Malaiwana estate is set on the hillside at the south end of Nai Thon Beach. A one-kilometre stretch of golden sand, water activities including standup paddle and snorkelling and low-key dining choices all lie within a few hundred metres of the estate. 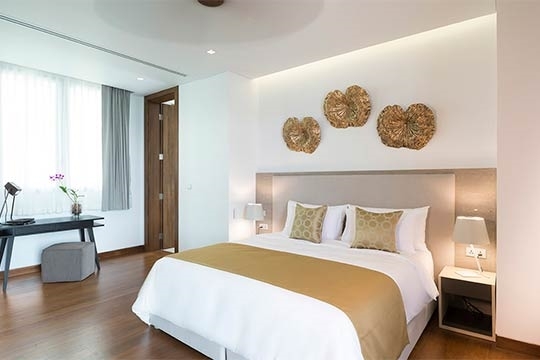 Situated just nine kilometres from Phuket airport, Nai Thon retains a sleepy village atmosphere. 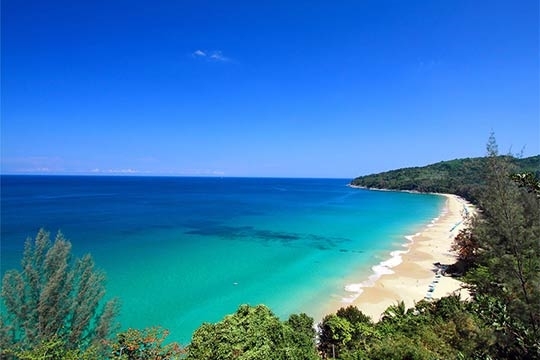 Though the beach could no longer be considered a “hidden gem”, it retains its lustre as a lesser-visited, picturesque spot along Phuket’s peaceful north-west coast. 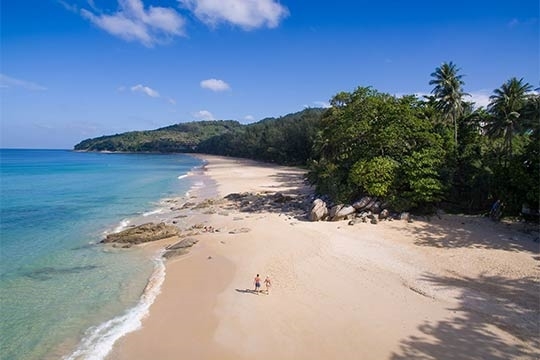 There aren't many undiscovered beaches left in Phuket but Nai Thon Beach comes close with its sparkling one-kilometre stretch of sand, clear waters and sunset views that have somehow eluded the tourist crowds. 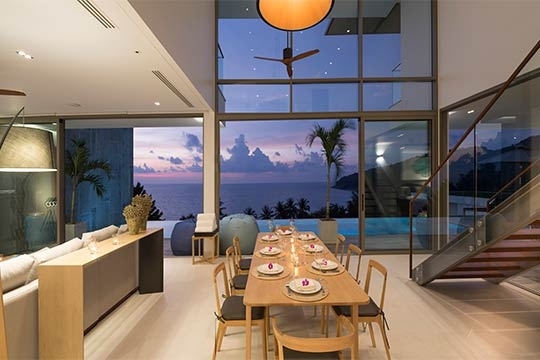 Found on Phuket’s tranquil northwest coast between Bang Tao Beach and Nai Yang Beach, Nai Thon manages to strike a perfect balance for beach lovers: quiet enough to give families or couples ample space to enjoy a peaceful day out, yet with a sprinkling of shops, bars and services for convenience. Much of the land surrounding Nai Thon is national parkland, protecting the lush, jungle-clad headlands and hillsides from development. 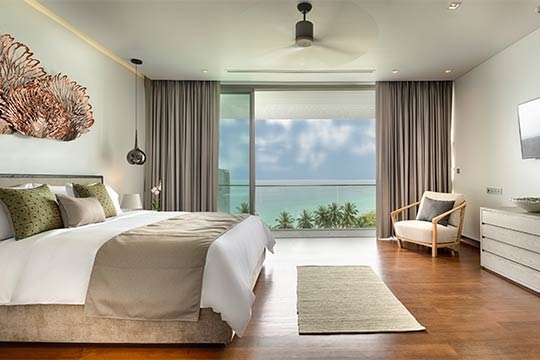 Though some luxury villas and resorts have opened in the area, Nai Thon remains a sleepy seaside village with a narrow paved road lined with small family-owned resorts and restaurants running the length of the beach. One of the best spots for beachfront dining is the low-key yet delicious Wiwai café that serves mostly Thai plus a few Western dishes. For a Thai-style takeaway, stop by the vendor stalls along the beach for some grilled meats, corn on the cob, refreshing coconut and more. The beach is partly shaded by casuarina and palm trees, with a limited number of beach umbrellas available for rent. Apart from swimming and sunbathing, popular water sports at Nai Thon include snorkelling, surfing and stand up paddling, and equipment for all of these fun activities is available for rent at the beach. Swimming may not always be possible during the southwest monsoon season (May through October) due to strong waves and currents, so be sure to heed the red-flag warnings during these months. For more beachside sports head to nearby Nai Yang where you’ll find kite surfing and even some scuba diving just off shore. And on Bang Tao Beach, a few kilometres to the south, you can find windsurfing as well as more surfing and stand up paddling. 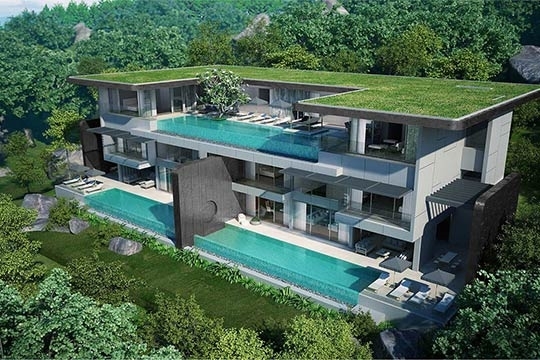 Though it has a secluded feel, Nai Thon offers easy access to the airport (less than 20 minutes by car) and some of Phuket’s top leisure activities and attractions, including golf courses, spas, Splash Jungle water park and some gorgeous ‘secret’ beaches. 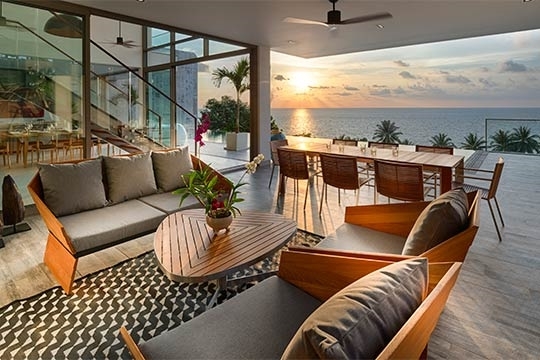 Those seeking a decadent beach-club dinner or Sunday seafood brunch will find some enticing choices at the Trisara Resort (2km), Dream Beach Club at Layan Beach and Catch Beach Club at Bang Tao Beach. 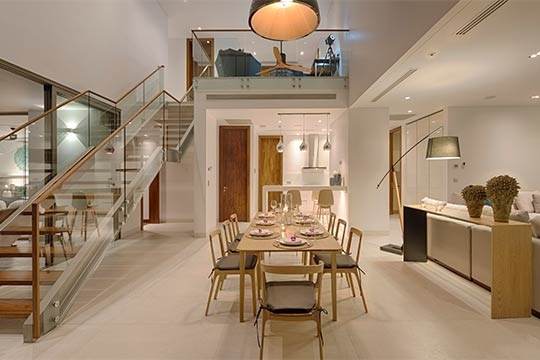 The bright, modern rooms of the Duplex are arranged over two floors of a three-storey residence with a central open-plan living and dining area on the bottom floor that opens to the pool terrace. 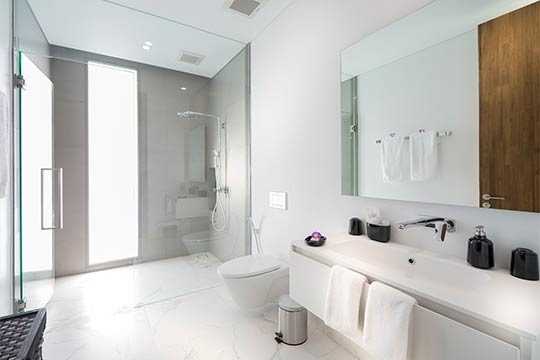 Glass, marble and white and grey accents give the Duplex a cool, relaxing tone of understated luxury, with air conditioning throughout. The two floors are connected by a staircase and a lift. 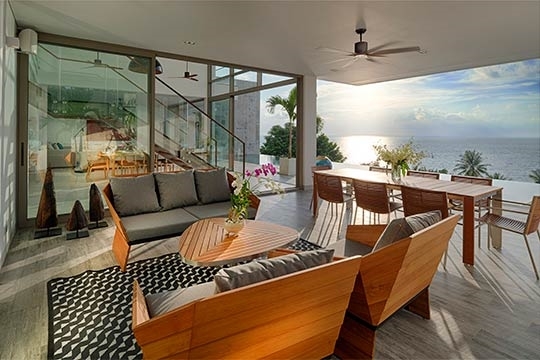 The living room has comfortable sofas positioned to best enjoy the views, just next to the dining area with a honey-toned wooden table for eight and a breakfast bar with three stools. The kitchen is found behind the dining area, available for guest use but mostly the chef’s domain. Sliding glass doors open to the terrace, where a 15-metre swimming pool stretches across the front, surrounded by ample decking with sofas, sunbeds and outdoor dining table with a barbecue, handy for indulging in seafood sizzle feasts at sunset. 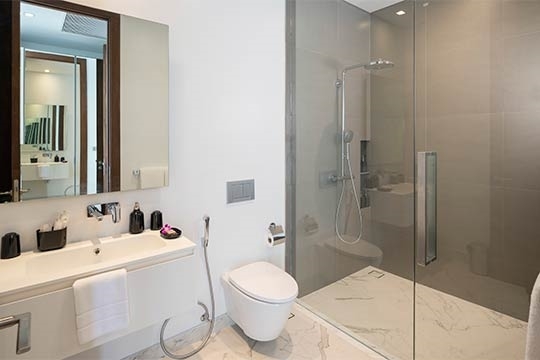 The two master bedroom suites are set at each end of the top floor, both with king-sized beds, wide sea views and large ensuite bathrooms swathed in marble, with soaker tubs, double vanity sets and dressing areas. Between the bedrooms is an open sitting area with a desk and sofa that overlooks the lower floor. Tucked away behind is a guest bedroom with ensuite bathrooms and a king-sized bed that converts to twins if preferred. Another guest bedroom is found on the lower floor, with sea views, direct access to the pool terrace, an ensuite bathroom and twin beds. 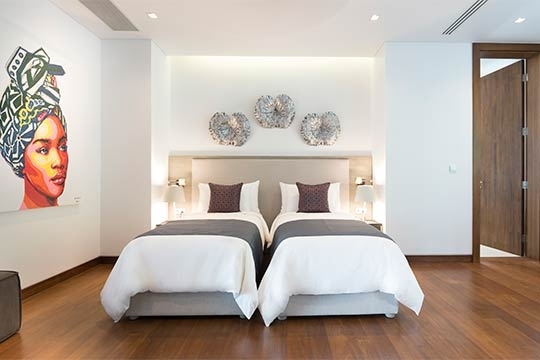 - Last minute bookings enjoy 10% discount when checking in before 04-May-2019. 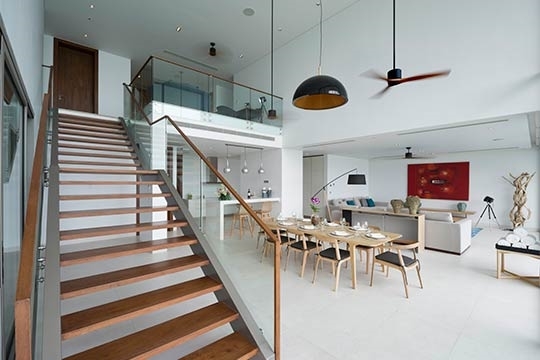 4 bedroom villa located in Nai Thon, Phuket. Ideal for Beach in ten, Body and soul, Bring the relatives, Kid friendly, Going for golf, Fair share for groups, Sensible for seniors, Room with a view, Walk into town, Child friendly. 8 out of 10 based on 18 user reviews.